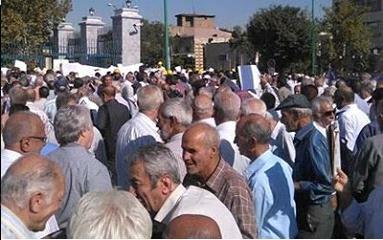 Tehran- For a third straight day retired Iranian steel workers protested on Tuesday outside the Iranian regime’s Majlis, or Parliament, in Tehran demanding their overdue pensions. The protest by retired workers of Iran’s Steel Industry began at 7.30 am local time. Protesters chanted “We want justice,” adding that they would not halt their protests until their demands were met. The regime’s suppressive state security forces were heavily present and attempted to prevent local people from joining the rally. On Monday the retired steel workers held a similar protest outside the Majlis which began at 8 am. An hour later some 50 suppressive security forces on motorbikes took up positions in the vicinity of the Majlis to prevent an escalation of the protest. One of the protesters said: Security agents confiscated the mobile phones of several women who were filming and photographing the rally. The police and plainclothes agents also prevented other people from getting near to the site of the rally and joining the protesters. Another protester pointed out that some 85,000 retired steel workers are owed two months of their pensions. He added: The Steel Industry Pension Fund is incapable of paying its debt, and this fund will soon go bankrupt. On Sunday around 5000 retired workers of the Steel Industry and their families gathered in front of the parliament to protest a delay in payment of their pensions and other insurance problems. Many of them had gone to Tehran from Isfahan, central Iran. The protesters carried placards with their demands. According to the protesters, in the past five years they have been deprived of some dividends such as those they ought to have received for hard labor and having children and a spouse. According to reports from Tehran, the Iranian regime dispatched hundreds of repressive forces from its special units and plainclothes agents to the place of the protest. The regime’s forces controlled the streets nearby, including where Shafa Yahyaian Hospital is located, and prevented people and vehicles from stopping in nearby streets. On April 11 more than 10,000 truck drivers in Bandar Abbas, Shiraz, Isfahan and Yazd went on strike to protest an increase in heavy taxes and corruption in the state Road Maintenance and Transportation Organization. Mr. Abbas Davari, Chair of the Labor Committee of the National Council of Resistance of Iran (NCRI), on April 12 hailed the striking drivers and called on all transportation syndicates and labor unions, as well as other defenders of labor rights to support the striking drivers in Iran. He urged the Iranian people, especially the youths, to support and to express their solidarity with the hardworking truck drivers and their families.  "While the Iranian regime spends billions of dollars of Iranian people’s wealth on its warmongering interventions and export of terrorism to the region and its nuclear and missile programs, the deprived class of the society only reaps poverty, misery, the pillage of their wages, and oppression," said a statement by the NCRI Labor Committee.